It's National Margarita Day! Let's for one day, ditch the tempering and enjoy a drink together! 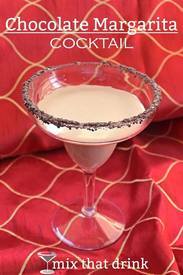 The Chocolate Margarita uses tequila and orange juice, but there any resemblance to a traditional Margarita ends. After that, it’s all Godiva chocolate liqueur, Hershey’s syrup and cream. The end result? A creamy, chocolatey concoction with just the right hint of orange.